I grew up with a father who was kind, gentle, and a bit crazy. Funny crazy, creative crazy. He was the life of the party wherever we went - and he loved to visit people. His heart was open to give of himself and his pockets were often empty after meeting with someone, as he gave them the last coins he had. I also remember waiting for him. Waited as he had to have everything to perfection before we could go somewhere on one our many evening visits. Waited as every inch of ice had to be scraped off the car windows when days where cold and frosty. Waited as he had errands to run all over town - and I had come to meet him and get a ride home after school. All the waiting has made me patient. I don't mind waiting. I don't mind sitting behind a slow driver in traffic. I don't care if I sit in the car waiting to pick a family member up at the train station and the train is half an hour late. Yesterday was the first day of Advent - the waiting period that leads up to Christmas Eve. Here in Norway, four Sundays leading up to Christmas Eve are celebrated by lighting one candle the first Sunday, two candles the second Sunday, and so on. It's a lovely tradition. Some sing songs and also have Christmas lights on a tree outside the house in time for the first Sunday of Advent. Advent is a season observed in many Western Christian churches as a time of expectant waiting and preparation for the celebration of the Nativity of Jesus at Christmas. The term is an anglicized version of the Latin word "adventus", meaning "coming". What are we waiting for? Christmas? Nativity? The birth of a Savior? Presents? Family traditions? Music? I don't mind admitting that my expectations are a combination of many of these. Maybe not so much presents anymore, but the cozy feeling of home, family and remembering the true meaning of Christmas. So, I wait. And it's worth while the wating - in fact the advent period is a gentle, loving kind of waiting. In fact I have waited for this "waiting period"a long time already. Today's water color was painted several years ago and made into a Christmas card. 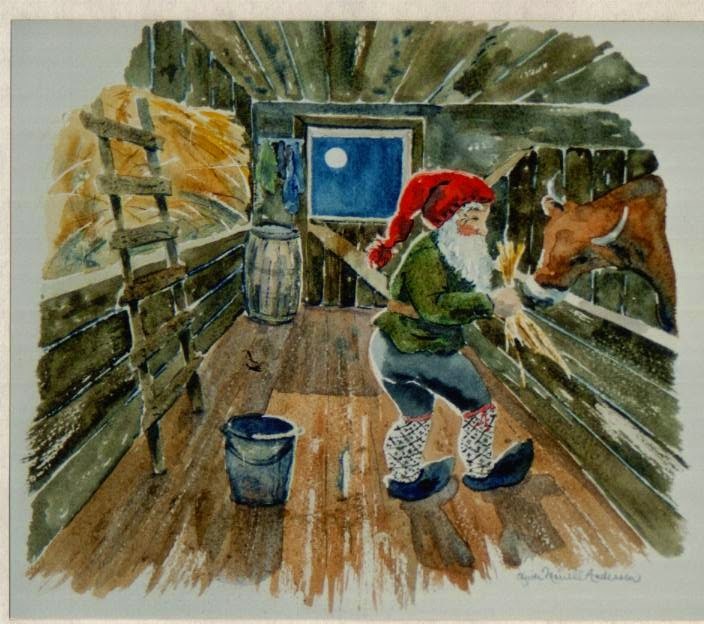 It depicts the Norwegian Christmas "nisse" who takes care of the animals on a farm.